As much as I do like getting “dolled up”, there’s been times when I need or have to leave the house and do something without feeling much like getting put together. Not that I take a lot of work to fix myself up, I just don’t leave the house too much looking like I rolled out of bed and sometimes I’d much rather stay in my cozy relaxed home lounge clothes looking like I really don’t care. I’ll bet most of you, my readers have those times, too. 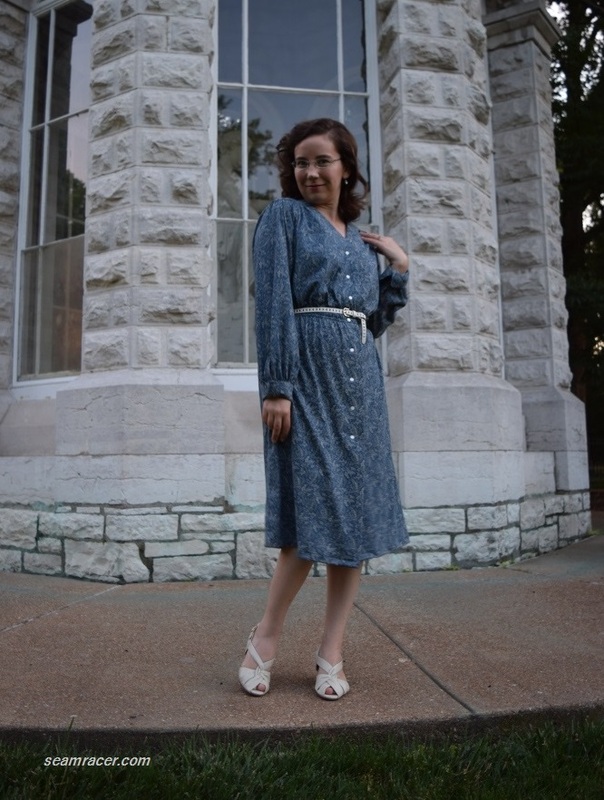 Well, I have now found a pattern to make myself a dress that is the perfect compromise – it’s every bit as comfy as a nightgown but a nice style for many occasions…all with a vintage flair. Perfect! How spoiled can I be making something exactly what I want so I can go out and still feel like I’m in house lounge-wear?! NOTIONS: I had all the thread and interfacing I needed, but I did have to go out and find one more pack of matching buttons (I had some of the ones I wanted to use but not enough). TIME TO COMPLETE: This dress took about 15 hours to sew, and was finished on May 20, 2016. THE INSIDES: As this knit does not fray, I left all the edges raw. TOTAL COST: This cotton was bought at the now defunct Hancock Fabrics. I believe I spent about $15 to $20 (with a discount), more than I normally spend for a dress but the fabric is such a nice quality. Burda Style has had this pattern out for a while now, hasn’t it? 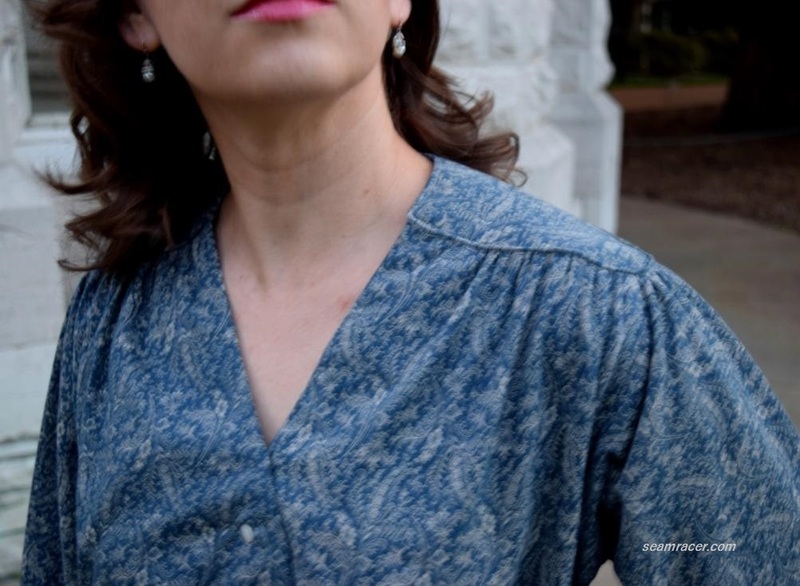 This is a shirt dress that rather reminds me of a cross between the 1980’s and the 1940’s, which is why it’s part of my “Retro Forward with Burda Style” blog series. 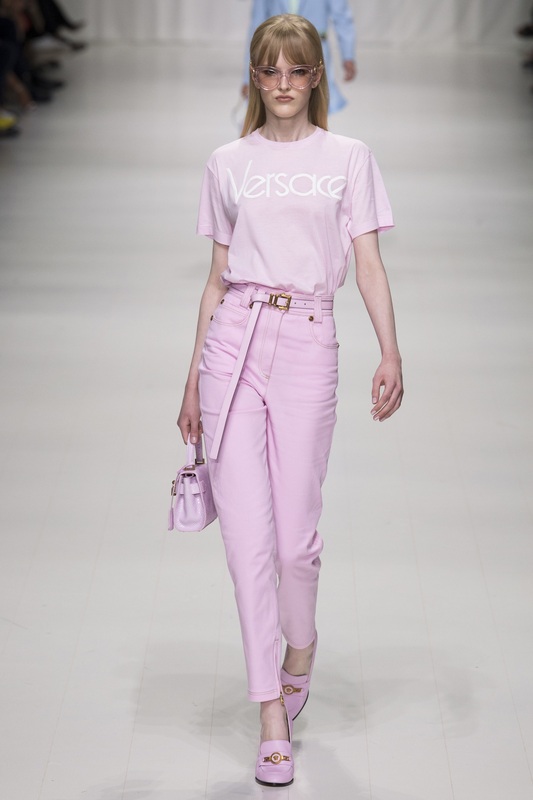 I know the 80’s did often mimic the 40’s in many ways such as exaggerated shoulders, generously sized bodices, lovely sleeve cuffs, neckline details, and feminine menswear – part of my dress. 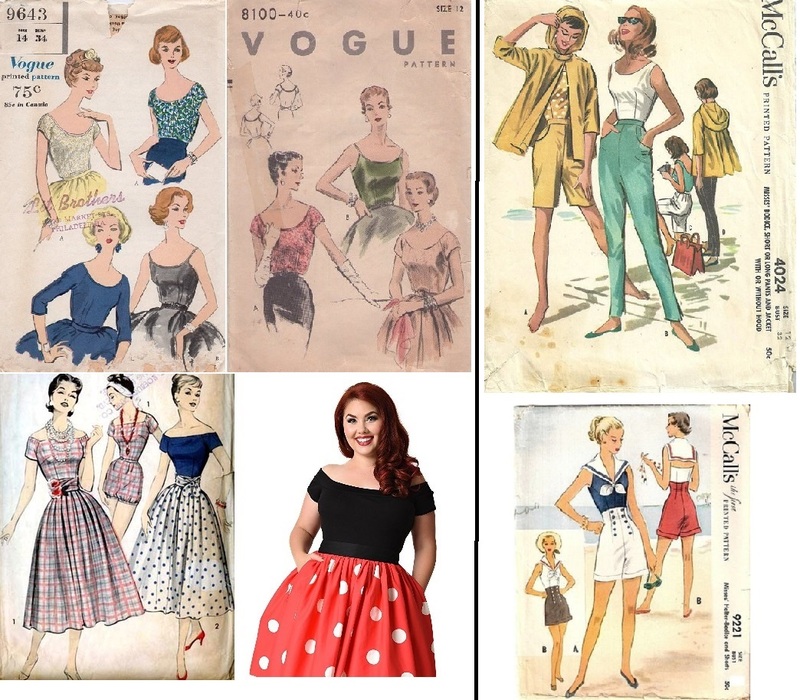 The 80’s and 40’s also made great use of jersey knits, except the skinny skirt and elastic waist sort of does sort of tip the scales in favor of the dress being in the decade closer to our own times, though WWII was all about combining comfort with style for women. Even my shoes are a 1940’s style, vintage from the 1980’s. So my verdict is non-committal – I’m happy with my dress whatever flair or style it might have. I was originally going to line the knit but I’m glad I didn’t as it would have made the seams much too bulky and the dress too heavy. Any fabric thicker than medium weight would not work here. 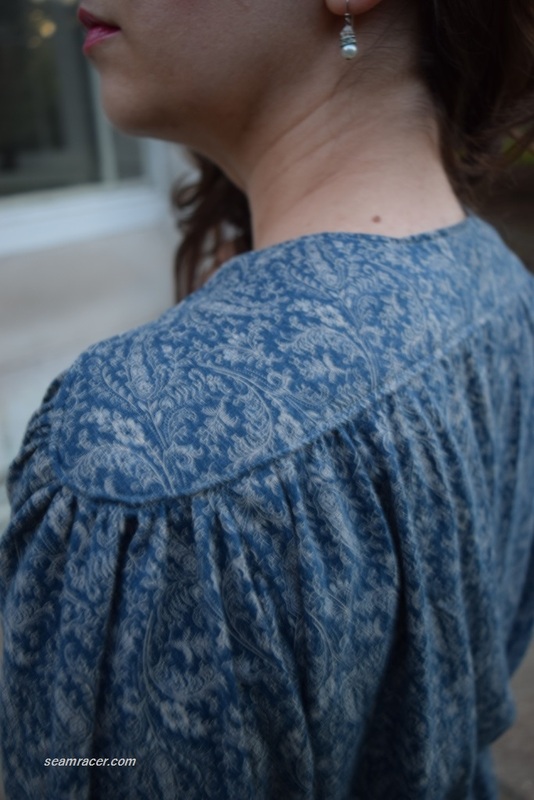 I also thought the dusty blue background and dainty small-print floral printed on the knit had a sort of quaintness which might bring out the vintage flair without being over-cute. When I bought this fabric, my friend the store employee told me the color and print suits me well and I do very much agree with that. The print unfortunately hides the special squared off sleeve design (see my layout of the bodice pieces picture, at left). As my project looks finished, I now see the small floral making my dress seem more like a housecoat than something to be worn out and about, but oh well. This was a bit of a challenging pattern to sew both on account of the decrepit instructions, the delicate fabric, and also because it is always a task to harness loads and loads of gathers. For this dress there are tight, full gathers from the neckline, around the shoulder piece, and over to the other side of the neckline in a continuous and dramatic line. Add in the fact of turning and shaping those uber-gathers into a definite shape and getting in down into a facing as well and there is a hand-stressing, time-intensive detailed area that used up all of my two boxes of straight pins just to keep in place for stitching. I messed up slightly on the shoulder panel and I do not feel entirely the one to blame (…although I did do the sewing). The instructions didn’t give me something to help at this point, so here’s another ‘oh well’. It still turned out o.k., I just would not recommended to top-stitch down the non-interfaced facing on top (from the visible outside) like I did. I made it work, but doing so made the whole intricate panel with the dress gatherings harder to achieve. Believe me, it would have been better the other way around. The neck and shoulder detail on this dress is stunningly lovely in my opinion, and worth the effort…if only I had done it 100% right. I think this is the part of the dress’ construction which takes just as long as making and cutting the rest of the dress combined. It also is the base from which the rest of the dress hangs and (in my opinion) the primary focal feature. (P.S., look how similar this dress bodice for sale on Etsy is to the one of my dress.) I have an idea that the shoulder panel of this Burda Style dress would look lovely in a contrast with the right combo of colors. I also adapted the sleeve cuffs (with another big ironic thank you to the instructions) due in part to another “mistake” of mine as well as tailoring the design to appeal to me better. After two frustrating spells of unpicking stitches after mismatching the proper cuffs with the correct sleeves I realized I had sewn the arch of the cuffs inward to my body rather than outward, which I should have done. I had had enough of futzing with things on the dress by this time and left them as they were. However, I did not like how wide the cuffs were on my shorter frame and compared to the rest of the dress, cuffs which went halfway up my arm did not seem to work here. Thus, I folded the cuffs back (just like the ones for my “Double Duty” year 1931 dress) and hand sewed a single elastic loop-and-button closure on each cuff to make them easy and adjustable. 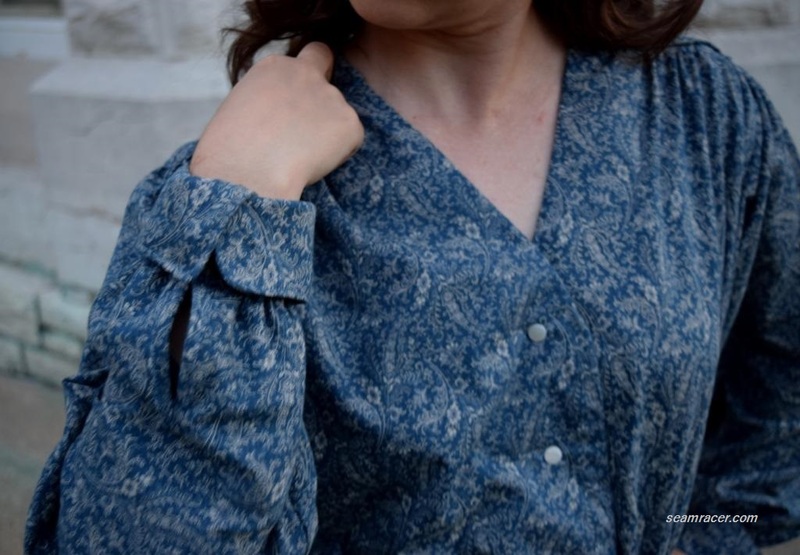 These turned back cuffs make the enormous sleeves a bit more manageable for me and add another nice touch to the dress. Besides all the little boo boos, I did some slight changes to the design. First, I raised the center front neckline enough to add another button closure for a less revealing decollete. 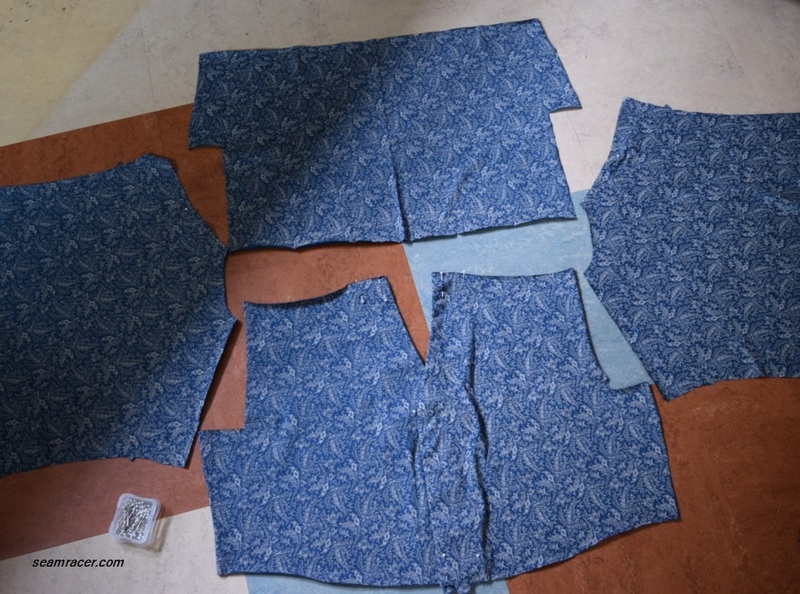 Second, I switched up the skirt front pattern pieces so that the designated bottom hem became the new waistline. As designed, the skirt to this dress is incredibly skinny at the knees and I saw a potential problem with walking, especially as the skirt buttons closed. This step slightly widens the hem but keeping the back skirt design as-is still keeps the tapered silhouette and makes it easier to walk. Granted, my dress’ skirt does open up above the knee at the thigh as it is, and I think this hint of hotness is need to save the dress from becoming overly conservative. “She’s got legs…” and I know how to (subtly) show ‘em. Finally, I left out the pockets. 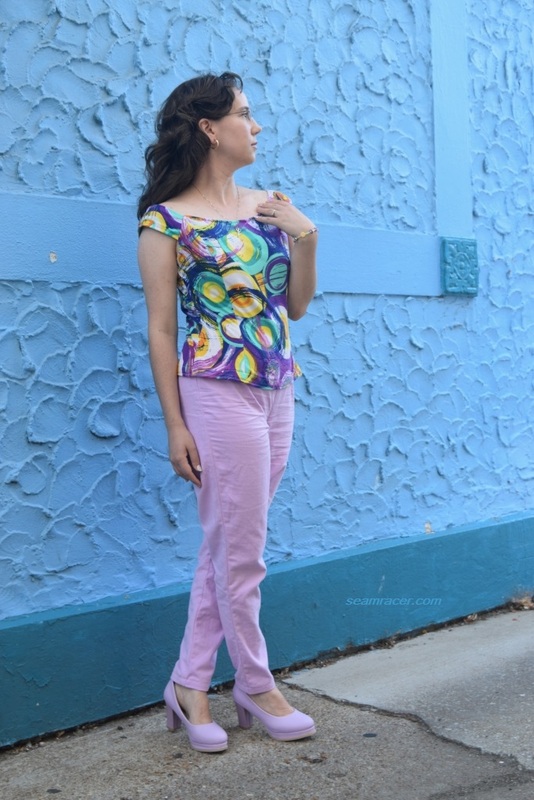 Yes, I love pockets and rely on them more and more, making sure I have them in most of the garments I now make, but no – there’s enough poufiness to the gathered elastic waist I’m happier with the overall look with them left out. The elastic waist does make this dress so incredibly comfy. So, as much as I was doubtful I would like it on myself, the wearing of it wins me over. I didn’t really bother with how the instructions said to make the waist because I had a method I wanted to use. Similar to my “Ever Green” knit dress, I used the existing seam allowance of the waistband to sew a skinny ¼ inch casing for elastic to run through. 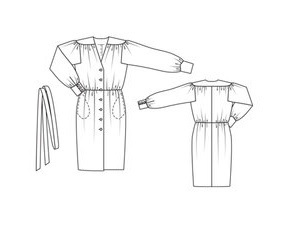 This method makes for quite tight gathering which isn’t too out of control as the casing is part of the dress, and anchored to it at both top and bottom. The skinny elastic makes it easy to cover with a belt. I sort of have a cheaters button at the waistband – a fake buttonhole with a button sewn to it. The real working closure is a hook-and-eye. This pulls the elastic waist together in a stable manner, versus a button closing. I don’t want anything popping open on me while I’m wearing my dress…boop, surprise! No, thank you. That’s why there’s even a tiny safety hook-and-eye at the V of the neckline, just in case. All said, I really do like my dress very much, I just don’t feel that the amount of effort and frustration was worth this dress. However, I find myself reaching for this more often than I’d ever had expected, so the usefulness and comfort which I’ve taken advantage of many times already does now make the effort worthwhile. 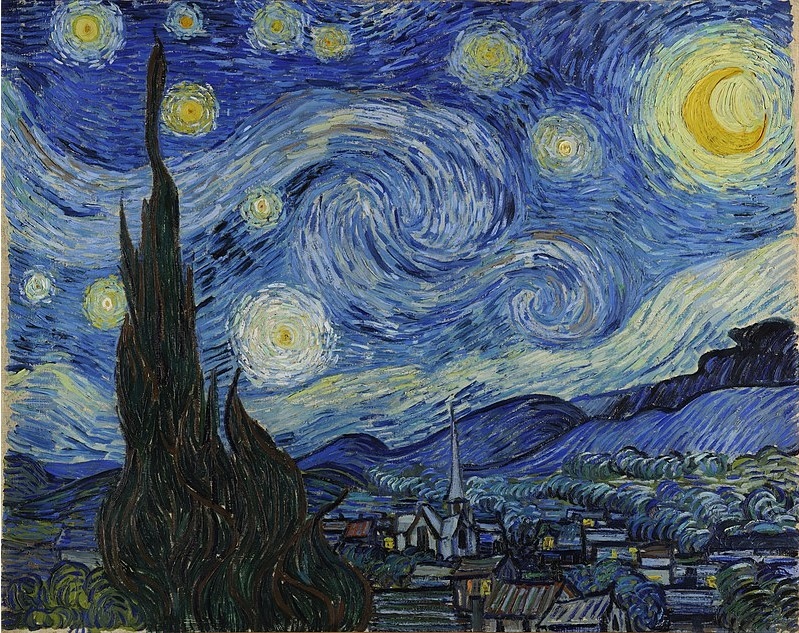 I am a very cold-sensitive person, and having my arms covered always feels quite comfy to me. So, the loose sleeves of this dress is perfect for chilly nights during spring, summer, and early fall where I live, with the open, leg-revealing skirt keeping me from being too warm. 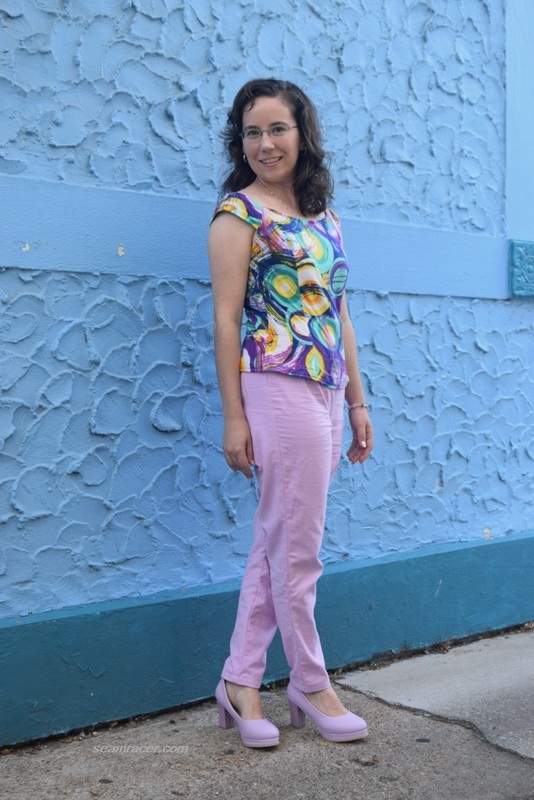 Here’s to a great one-step outfit, not too nice yet with casual ease! 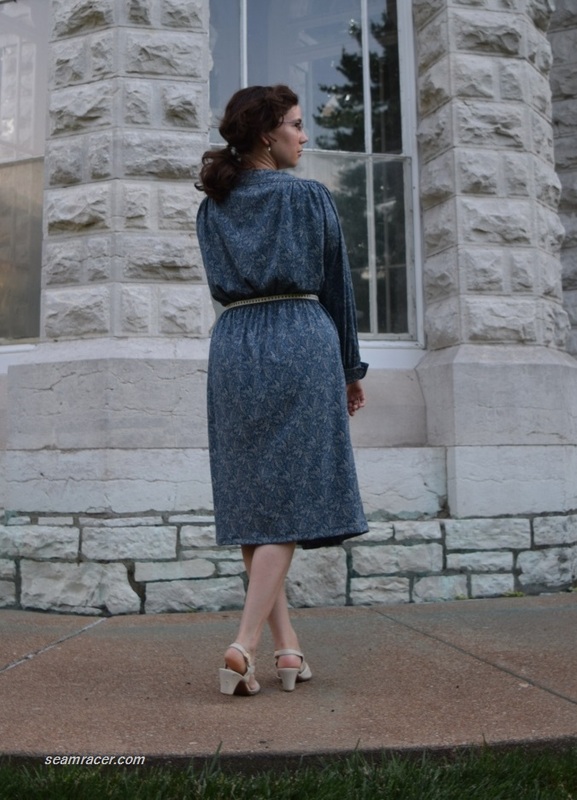 And, here’s to a “new” type of clothing…what I call the “housecoat” dress, ideal for rolling out of bed and keeping the feeling but not the look. 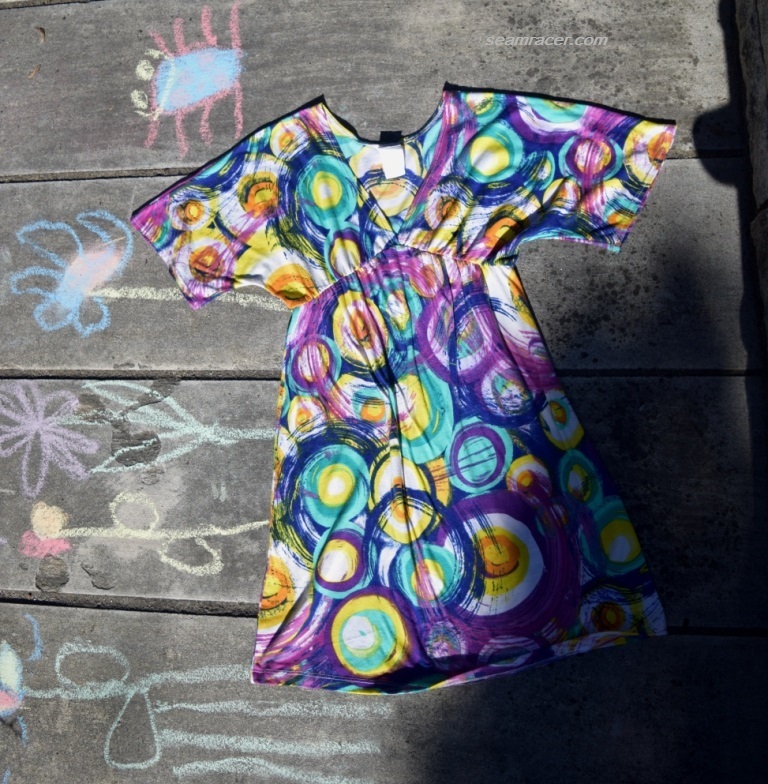 The perfect dress for one’s needs can be so wonderful!